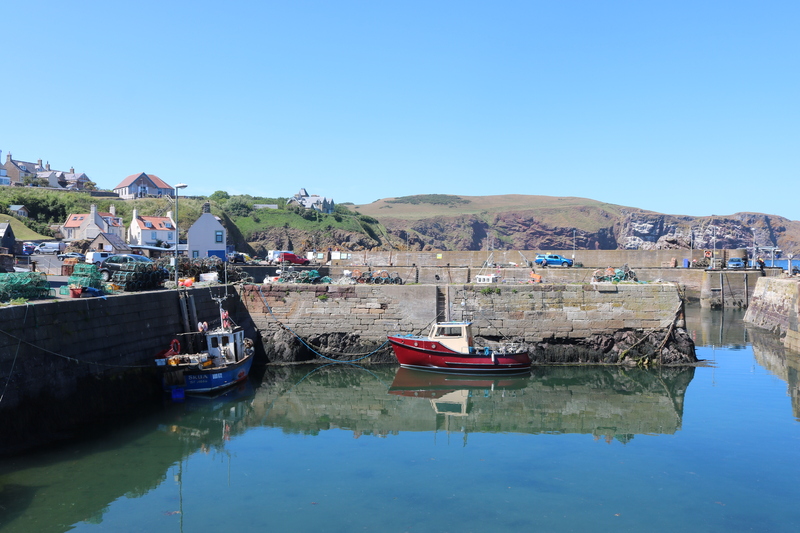 On a sunny Sunday afternoon, we drove the 8.6 miles (14K) to the tiny hamlet of Cove (good photos) where a few cottages overlook the sea in a beautiful setting – on a summer’s day. We walked down the steep path to the secluded little harbour. Cove is one of these places that you would not come across by accident, as it is off the main road. 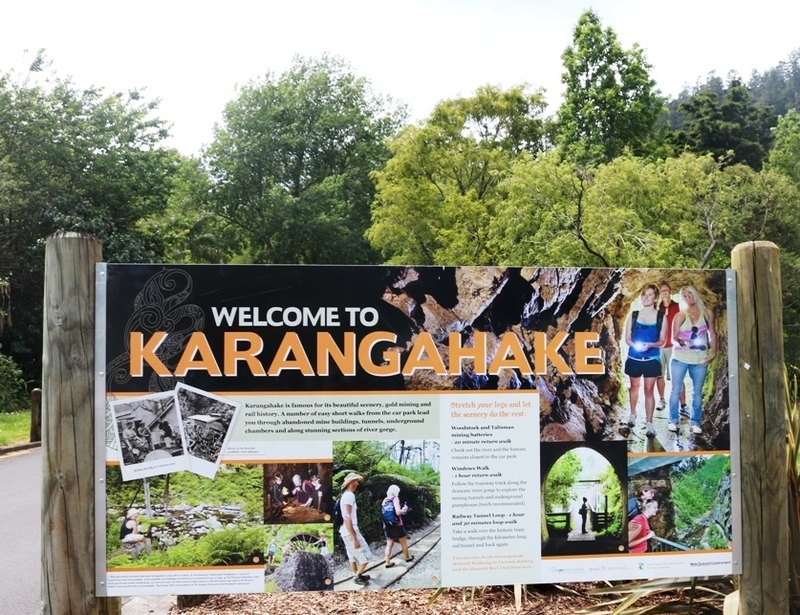 As you walk down the path, to your left, you can see the steep sandstone cliffs. 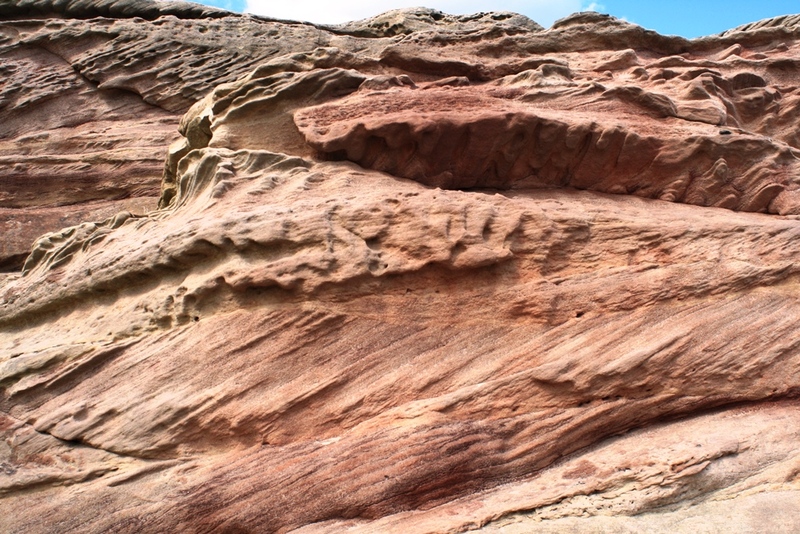 This area is well-known for its geology and the upper old red sandstone was observed in this area by James Hutton, known as the founder of modern geology. Further down the path, you look out to the sea and on the shore are what look like man-made structures but are “shales and thin coals” according to one geology source. 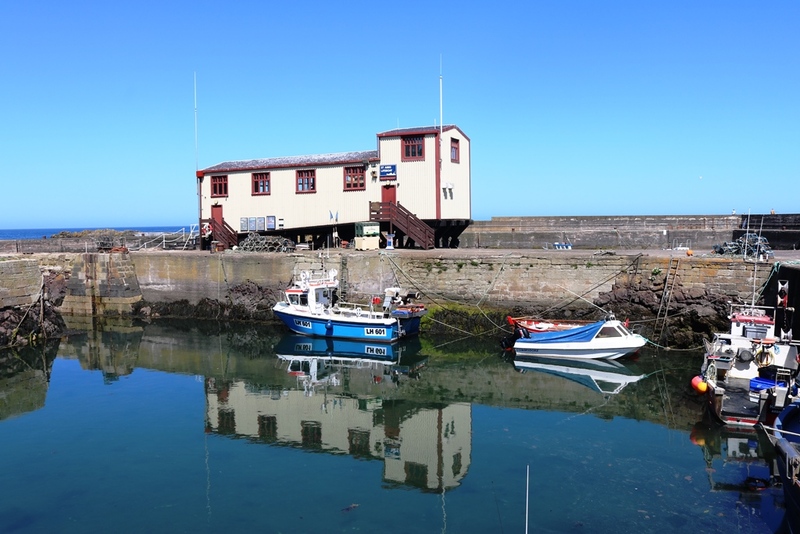 You then walk through a narrow – and on a sunny day, very dark – tunnel from which you emerge to see the small harbour at Cove – photo below. 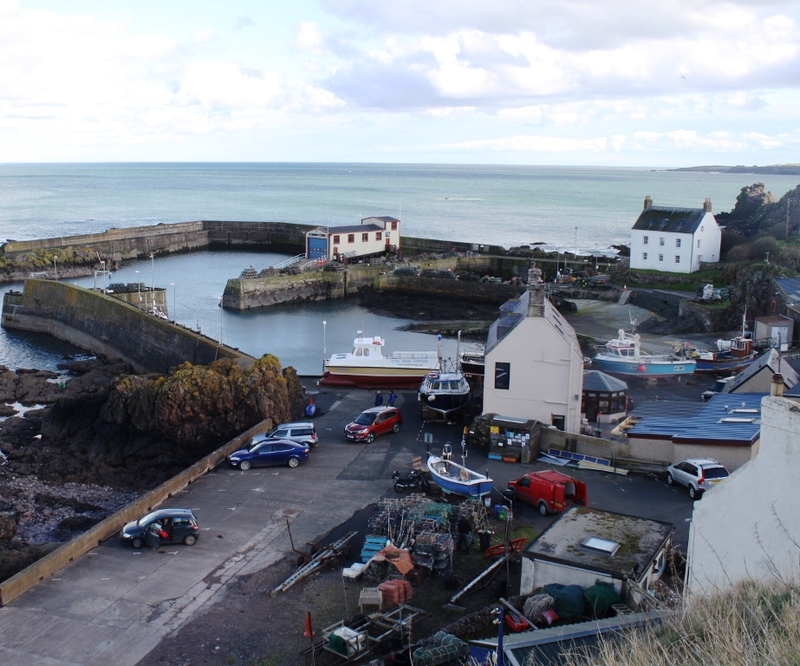 In the harbour are a couple of small creel boats and some small leisure craft. 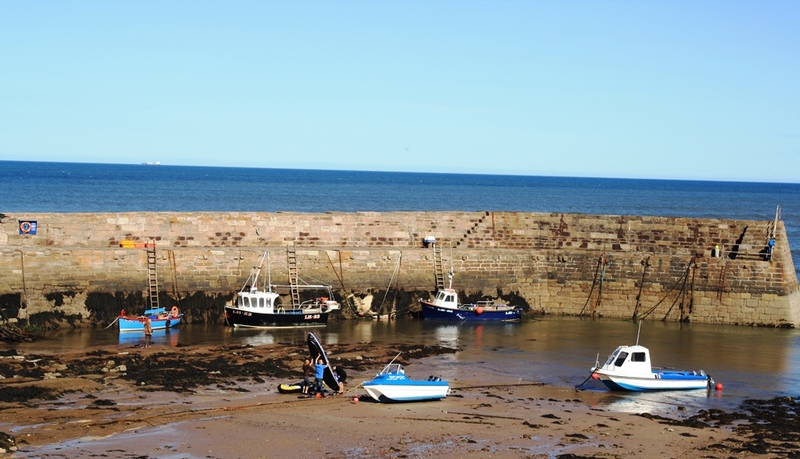 The harbour is well protected by the sea wall and just to the left of the wall above, there is a natural wall of limestone and sandstone, with a variety of colours in it. If you look very closely at the sandstone, you can see tiny fossils – perhaps from millions of years ago. In the photo below, you can see the intricate patterns which the wind, rain, frost and sea have formed over the millenia. This was here long before the harbour was built and you wonder who was the first human to touch this stone. This is an intriguing and very peaceful walk on a day when the strong winds and high tides are absent. I did a video of the walk and you can see the wide range of rock formations on the cliffs, the shore and near the harbour. Recently, within one week, we had a thunderstorm on one day and a calm day, followed by an impressive sunset on another day. The day of the thunderstorm produced a truly threatening sky. The photo below looks towards the horizon from our house. The sky appeared to have twisted itself into a fury from the top of the photo, down to what looked like a clenched fist, ready to punch the horizon. The large tanker parked out there, is dwarfed by this natural phenomenon and is being drenched in rain. What the photo does not show is the constantly shifting shape of the clouds, which slowly writhed and reformed as you watched it. It was so mesmerizing that I must have watched it for 5 minutes, as it very, very slowly moved eastwards along the horizon. Two days later, the storm was a mere memory. The sky was clear and the sea returned to a calm blue for most of the day. I’ve taken many photos of the sunsets in Dunbar and very few of them look the same. 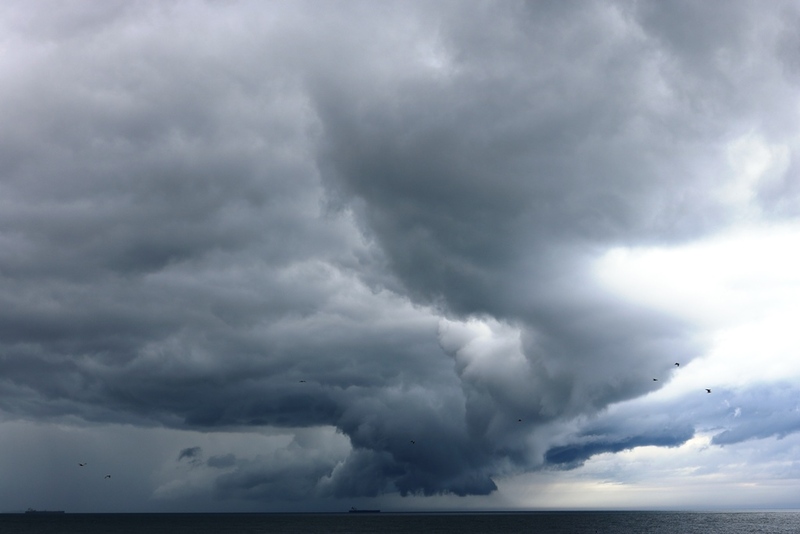 On the evening of the photo below, the clouds appeared to be falling towards the sea, taking on a range of colours as they slowly drifted across the sky. 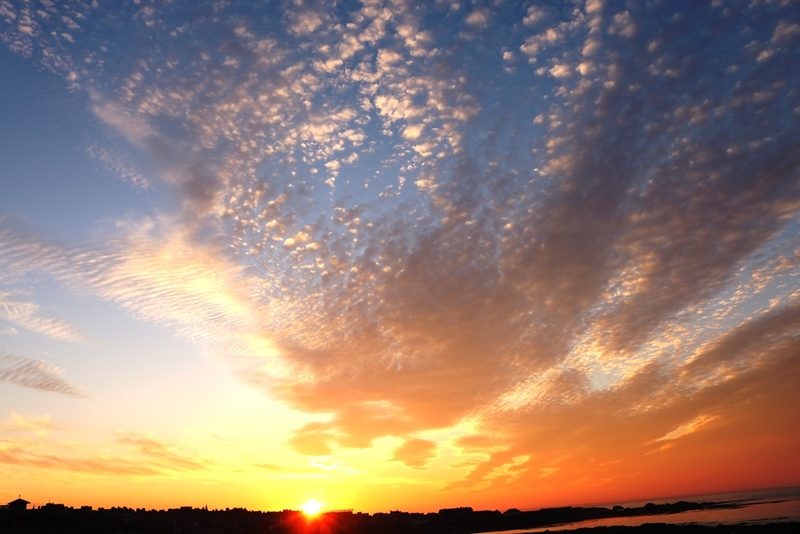 To the left, the white clouds take on the shape of a fish skeleton and are sometimes known as mackerel skies. My memory from primary 7 at school is that our excellent teacher Miss Murray, called them haddock clouds or skies and they are a sign of good weather to come. Sure enough, the next day was sunny and cloudless. 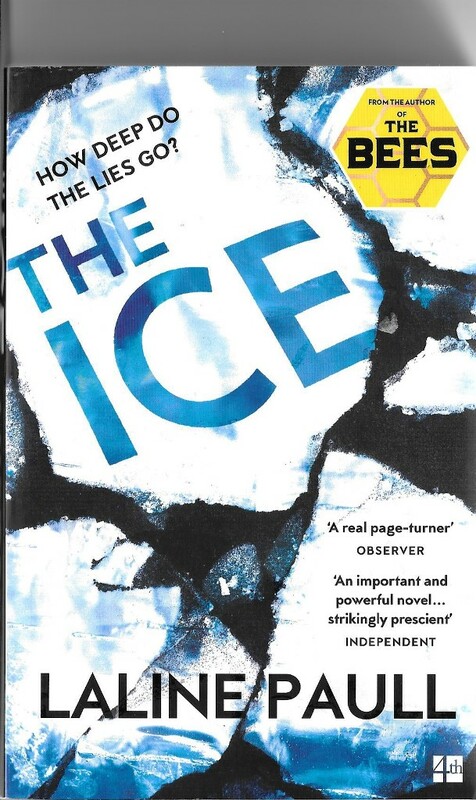 I’ve just finished reading The Ice (Guardian review) by Laline Paull. 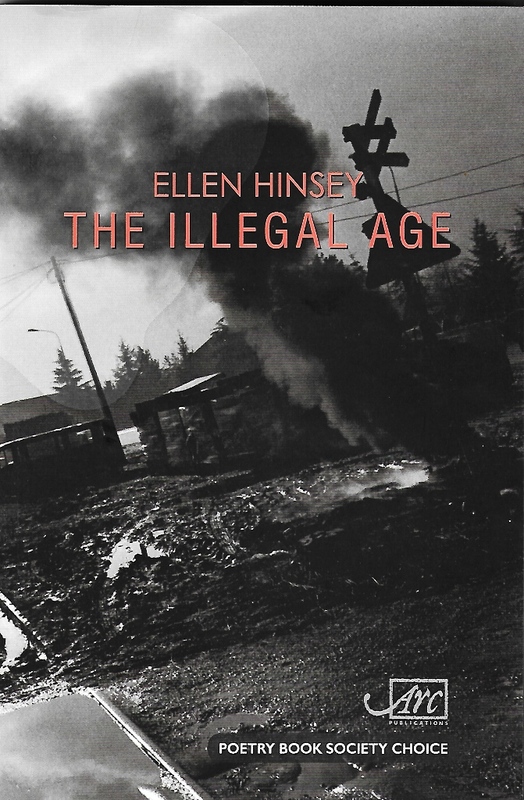 The book comes with high praise on its cover – “An important and powerful novel … strikingly prescient” according to The Independent. The novel is set in the (not too distant?) future as the Arctic ice has melted and opened up new shipping lanes, and it focuses on the friendship between relatively poor boy made rich Sean Cawson and the more wealthy radical environmentalist Tom Harding. After Tom’s death in an Arctic cave, his body disappears but is resurrected – still frozen – by a glacier calving. Much of the book is set during the inquest into Tom’s death and this is intersected with flashbacks to the scene where Tom died. Throughout the book, the reader is given more and more insight into what happened, so there is a tension as more details are released. Who is telling the whole truth? In the background, a luxury lodge has been developed in the Arctic circle and again, Paull gives details about possible uses – legal and illegal/immoral – of this lodge. For four fifths of the book, I thought that this was a well written novel which highlighted key aspects of climate change and its effects on our planet. Unlike the Guardian reviewer, I thought that the final part was overly dramatic, with the author desperate to have a multi-faceted conclusion. The descriptions of the Arctic environment provide an interesting and at times beautiful background to the story. A range of key issues relating to climate change are highlighted in the book but the author does not preach. The book also raises issues relating to capitalism, international trade and possible arms trading. I would not praise this book as highly as several reviewers have, so you will have to judge for yourself. I would urge people to buy it and read it, as it is well plotted, with some good characterisation. 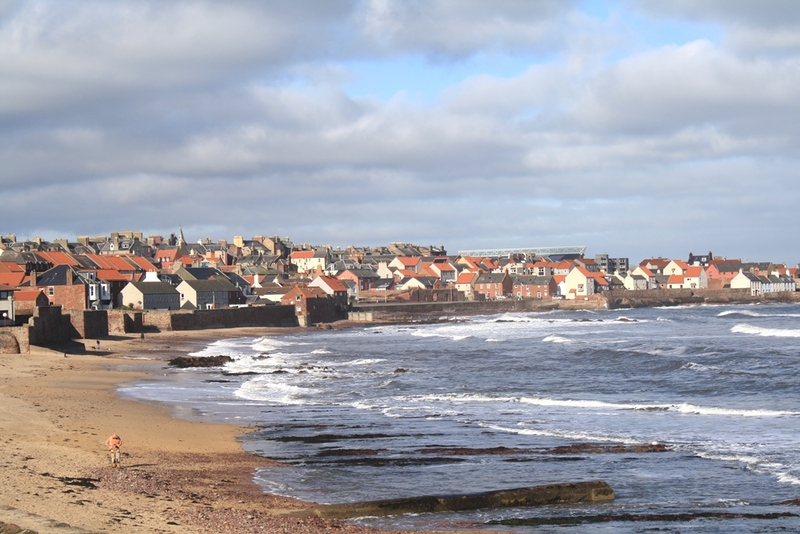 I featured the Guardian’s Country Diary recently on this blog here but I am returning to it now as the subject of the diary on 5th May was Barns Ness, which is about 2 miles from my house. 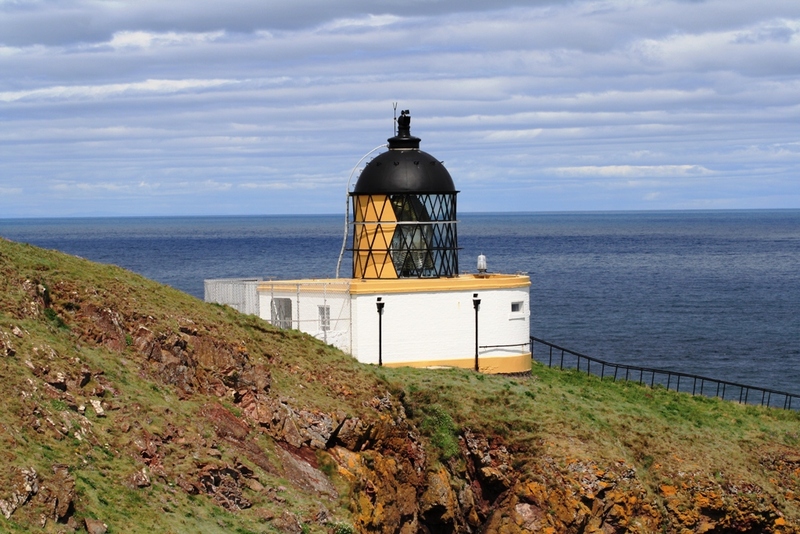 The lighthouse (photo below) is the outstanding man-made structure at Barns Ness but the coastal environment is what firstly interests the writer. As with all the Diary entries, this one is very well written e.g. “The pools themselves seem empty on first approach, but after a minute’s silent watch they come to life: periwinkles inching almost imperceptibly along, shore crabs sidling from under rocks with a suspicious air, and – best of all – tiny hermit crabs in their pilfered shells, peeking shyly out, antennae waving”. There’s poetry in here, with crabs having “a suspicious air” and the hermit crabs’ “pilfered shells”. This entry is by Cal Flyn and you can see all her Diary contributions here. Not far from the lighthouse is the Whitesands beach (good photo) and on clear sunny days, the beach almost looks white, so pale is the sand. The author comments on the limestone pavements (my photo below) which lie at the east end of the beach. These are a rich source of fossils and when you walk across their pockmarked surfaces, it is like looking down on a huge archipelago from a plane. 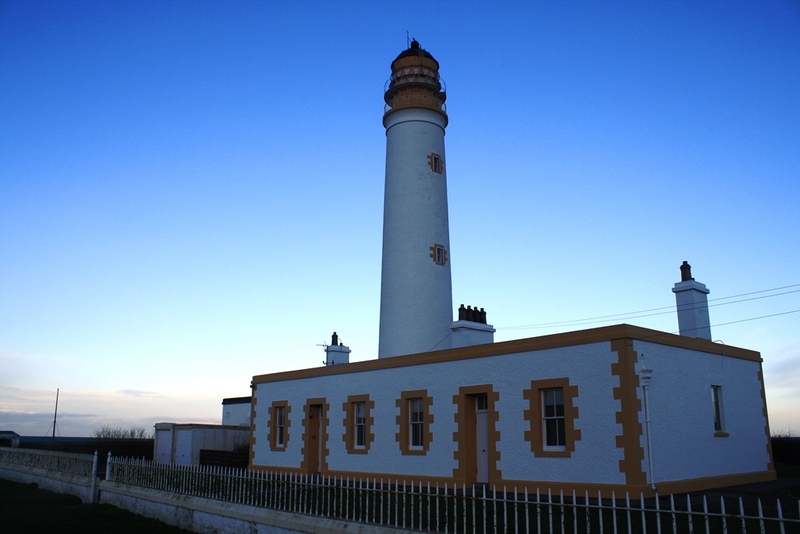 Flyn notes that she stayed at the cottages next to the lighthouse and ironically, the haar – known to us as a sea mist but originally (see link) an easterly wind – came in while they were exploring. It was only when the lighthouse loomed out of the mist that they knew they were home. Flyn comments “Who knew we’d need a lighthouse to navigate the land?”. The cottages can be seen in my photo below. 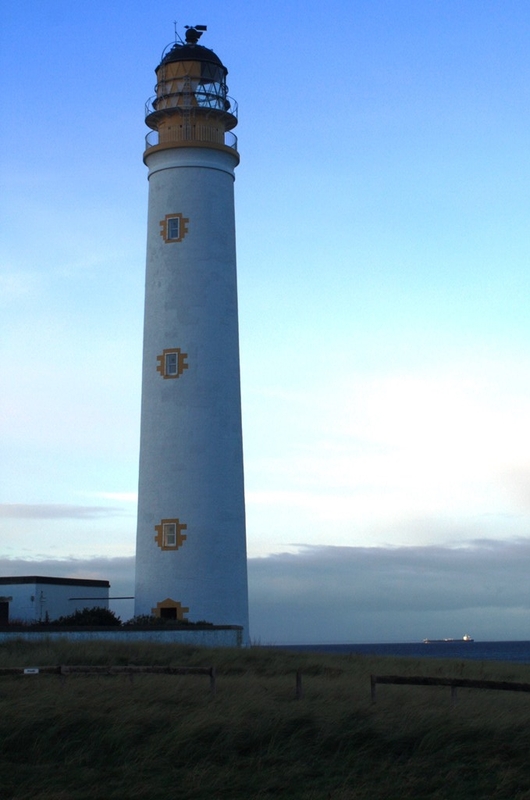 If you are ever in the area, Barns Ness is a great place for walking, with an ever changing shoreline. 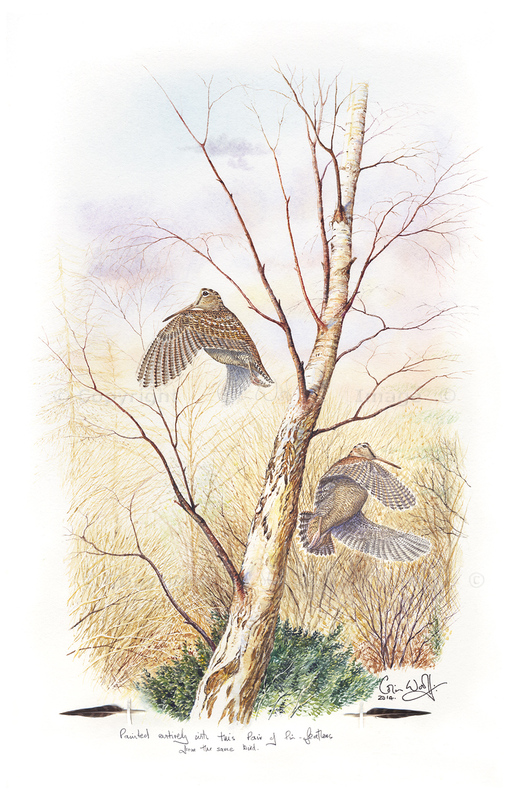 At this time of year, you can hear the skylarks singing joyously above you, although they may be hard to spot. 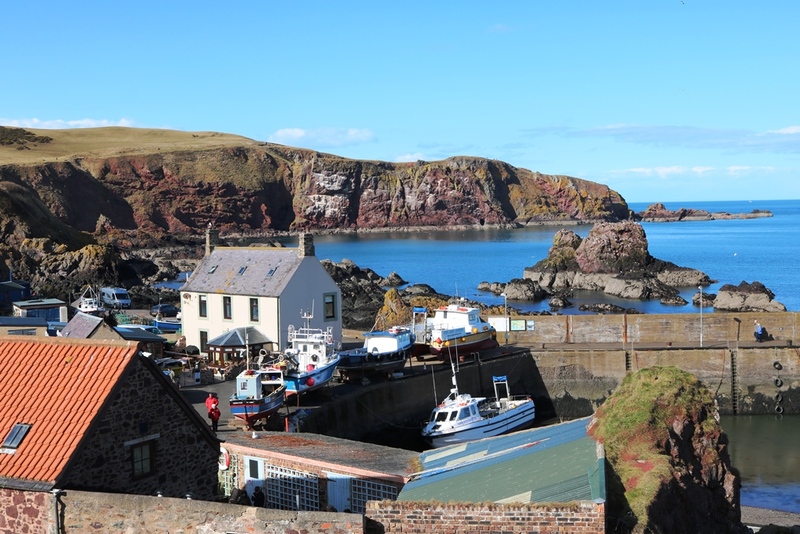 Another trip to St Abbs Head (good photos) on one of the few sunny days we’ve had recently. It was still very cold on the day we went and the wind from the southwest was distinctly chilly. We left the car near the information centre, café and gallery and walked up to the top of the cliffs. 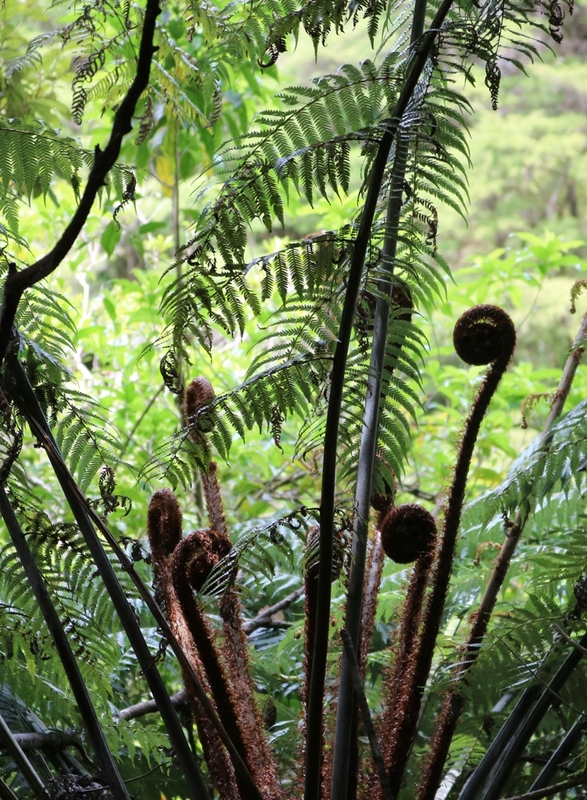 There is a circular walk (good photos) of 4 miles (6.25k) which we’ve done many times over the years. You can start the walk on the east or west side and you choose the direction according to the wind. As we were only doing a short walk, we went on the path at the east side and you pass the farm buildings and the horse field, with its practice arena, before you come to the edge of the cliffs. 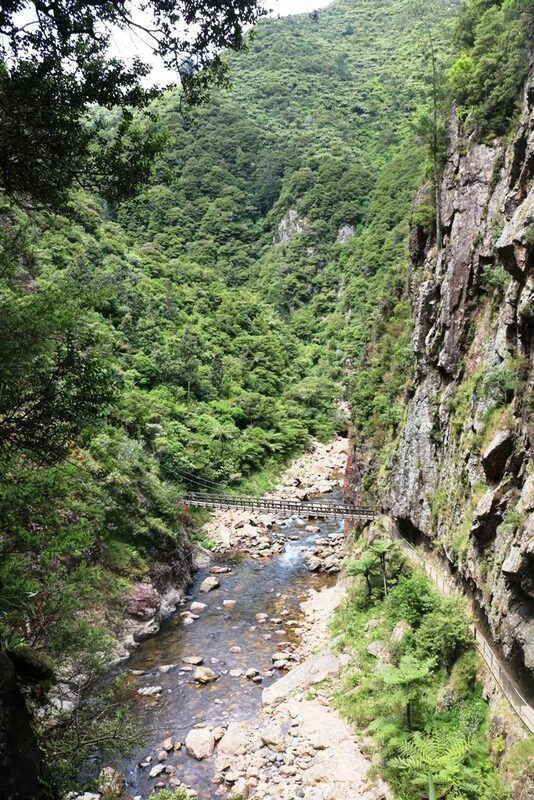 As you walk up the path, you are quickly above quite vertiginous cliffs but you get a superb view of the rock formations below you, as in the photo below. You can find out much more about these formations here. This source notes that the rocks have been “locally weathered to a characteristic yellow colour” which you can see below. On the rocks on the right hand side, you can see the newly arrived kittiwake nests. In the next photo, taken from the path just above the harbour, you are looking across the harbour to the clifftop walk and the steep cliffs. 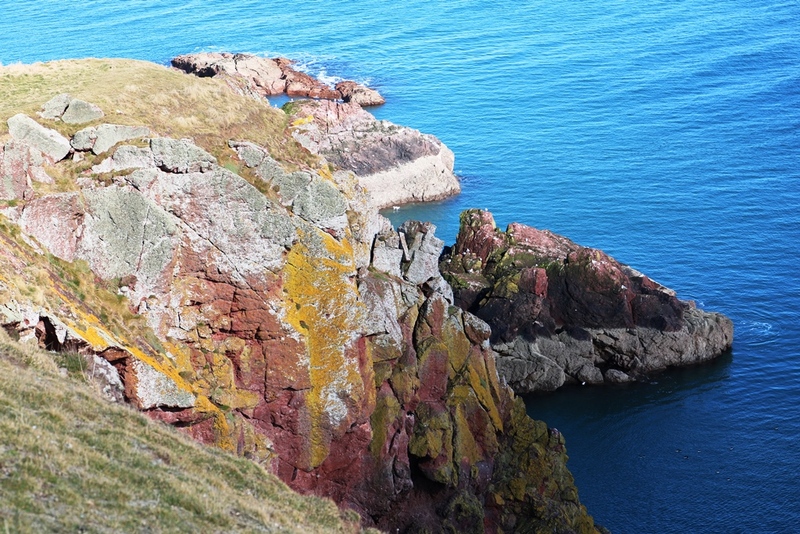 You can see extensive white patches on the Cliffside, but there is no bird life there at the moment. Soon this will be packed with guillemots, hundreds of which pack the narrow ledges to make their nests. 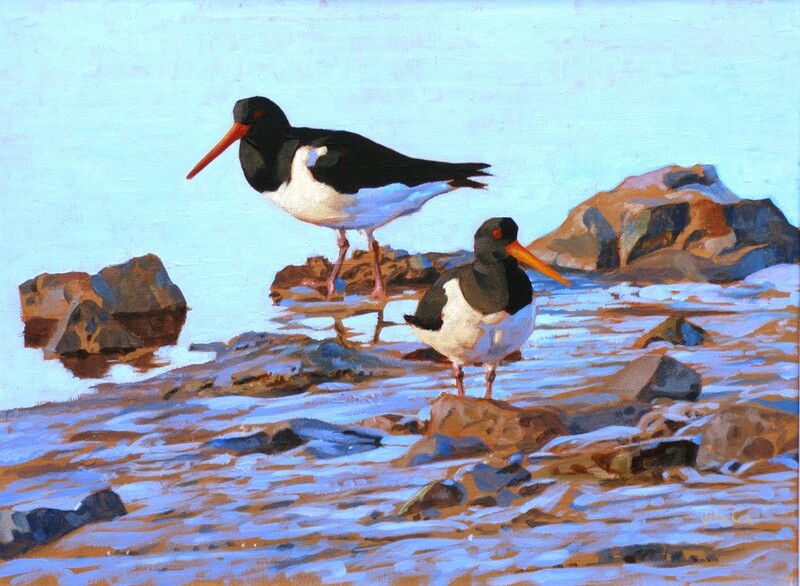 When these charming birds arrive, there will be a cacophony of noise as they jostle for position on the rocks and appear to have endless disputes with their neighbours. You can listen to an example of the guillemots’ disputatious calls here. 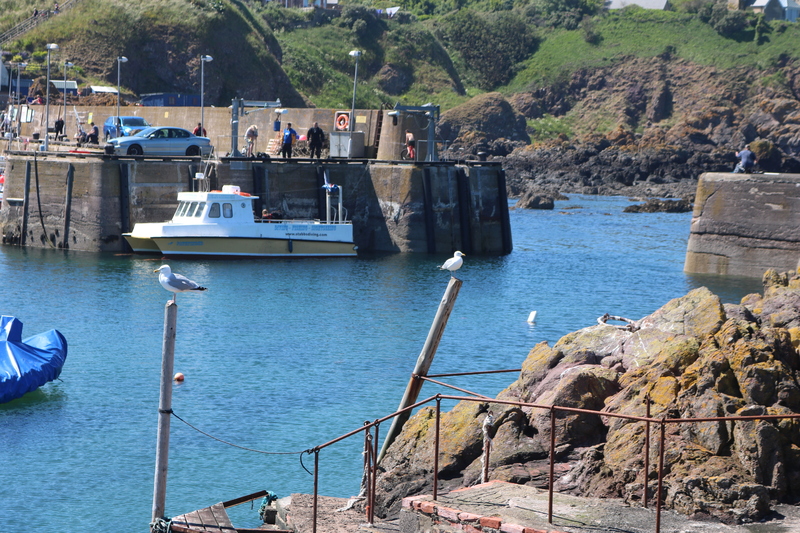 The boats on the harbour side will be in the water during the late spring and summer months, taking people out on trips around the coast and taking divers out to explore the clear waters near St Abbs Head. Over the wall from the boats, you can see the tide marks on the rocks, with the lighter shades on view indicating that the photo was taken when the tide was fairly well out. I took some wee videos while on the walk and I’ve added a narration and uploaded the combined videos to Youtube. I’m still at the early stages of video and I have to buy a tripod, as bits of the video are still too shaky.adding narration is a step forward. You can see the video – click on full screen for best effect – here. The post has been delayed as I worked out how upload effectively. 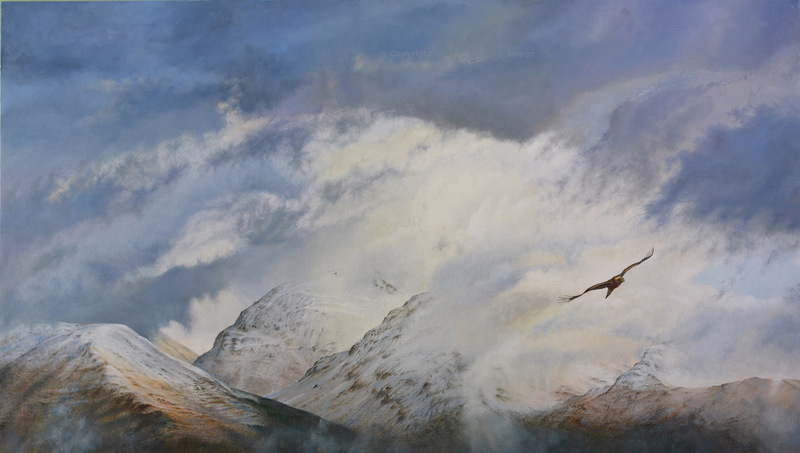 I recently went to a fabulous exhibition of wildlife photography in the National Museum of Scotland. You do have to buy a ticket for this exhibition, which is on loan from the Natural History Museum in London, but it is well worth it. If you go to the exhibition website and scroll down to Inside the Exhibition, you will see that you enter a darkened room with the photographs lit up on the walls. This is slightly disconcerting at first but you soon appreciate the effect it has in making the photographs stand out more. The Wildlife Photographer of the Year is a global competition, with over 50,000 exhibits in 2018, so what you are seeing is some of the best wildlife photography around. You need to go slowly around the exhibition as you are confronted with a succession of absolutely stunning photos, each quite different, but the precision and the clarity of the works on display is breathtaking. I contacted the Museum – by email and phone – to get permission to show the 2 examples below, with no reply. I am assuming that as I am advertising the exhibition and only showing 2 examples – both available on the exhibition website – that I am not contravening the spirit of copyright law here. The first photo I selected is an intimate portrayal of a bear family by Marco Urso (includes many examples of his work) from Italy. 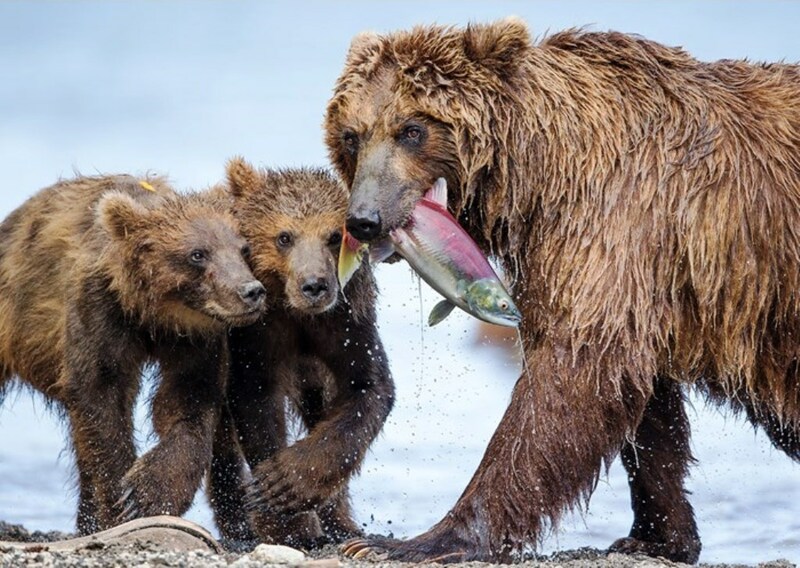 You really can see the anticipation of the title in the young bears’ eyes and the delicate colours of the salmon enhance the photograph. The quality of the photo so high that you can see the drips of water coming off the bears’ skins and off the salmon. 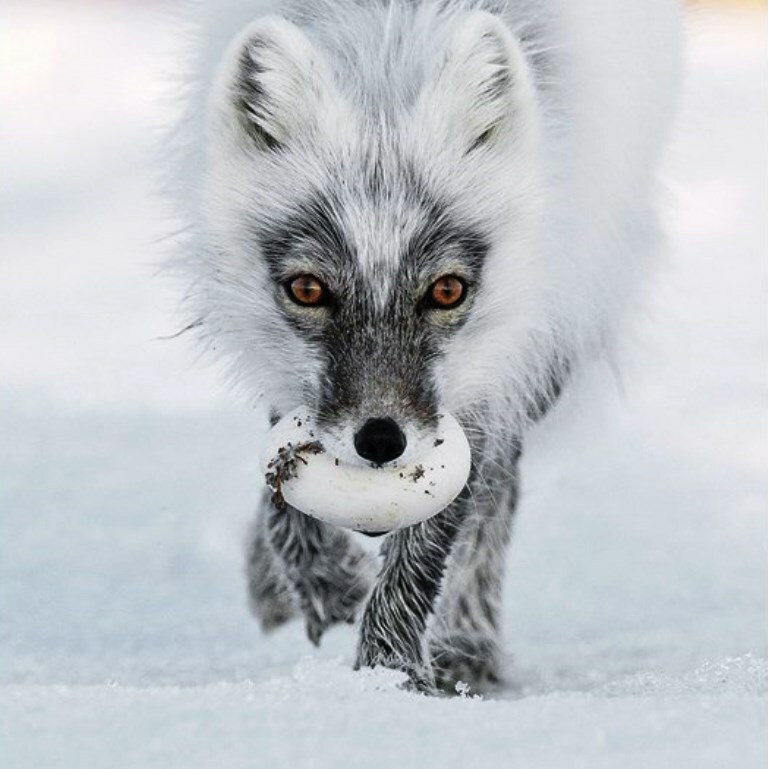 The second photo was a winner in its category and shows an arctic fox which has stolen a snow goose egg on Wrangel Island (more superb photos) in Russia. The photographer Sergey Gorshkov spent many days trying to capture this exquisite portrait of the fox with its loot in its mouth. The eyes of the fox are captivating and you find yourself staring into its eyes, seeing the determination of the animal to deliver food to its family. The detail of the fox’s fur is amazingly clear and the white fur almost melting into the white snow gives an impression of how cold it might be. If you get a chance to see this exhibition anywhere in the world, do not pass it up. The exhibition also highlights the dangers faced by the environment across the world and the animals who live there. Some of the photos e.g. of hunted rhinos, are quite upsetting. Overall, the memory of this exhibition is of looking in wonder at the photos and appreciating the technical quality and artistry of the photographers. Through the post recently came the latest copy of Scottish Birds which I receive as a member of the Scottish Ornithologists’ Club (SOC). I was struck by the front and back covers which I think are possibly the most attractive of the year. The journal contains articles on in-depth research on birds in Scotland – their numbers, their habitat and trends in population. There are also shorter articles on rare sightings of visiting birds. I have to admit that I don’t read the research articles in full, but I particularly enjoy the photographs of birds which accompany the articles. I don’t count myself as a birder as I don’t do any serious bird watching. Please don’t use the term twitcher for bird watchers as this is regarded as pejorative, a bit like referring to serious runners as joggers or The Inuit as Eskimos. I’ve been given permission to scan and use the covers by the good people who run SOC. 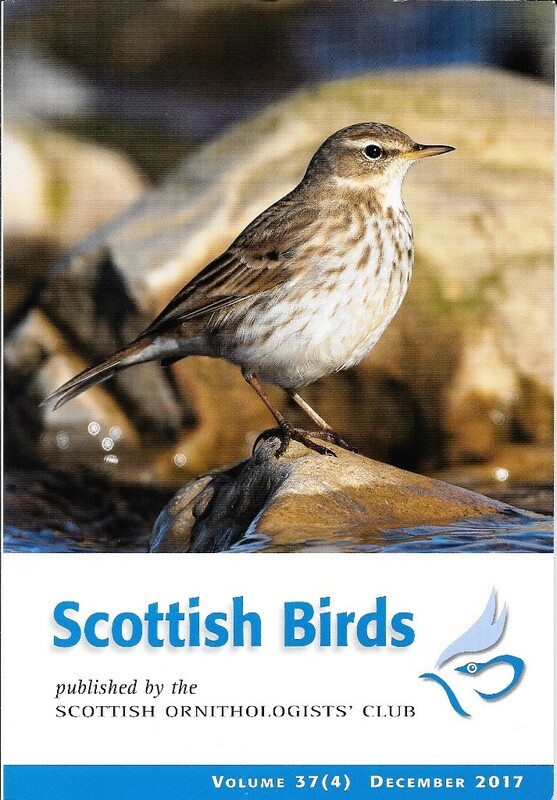 The front cover below shows a water pipit which was photographed at Skateraw, which is along the coast from Dunbar and on one of my mountain bike cycling routes in the winter. 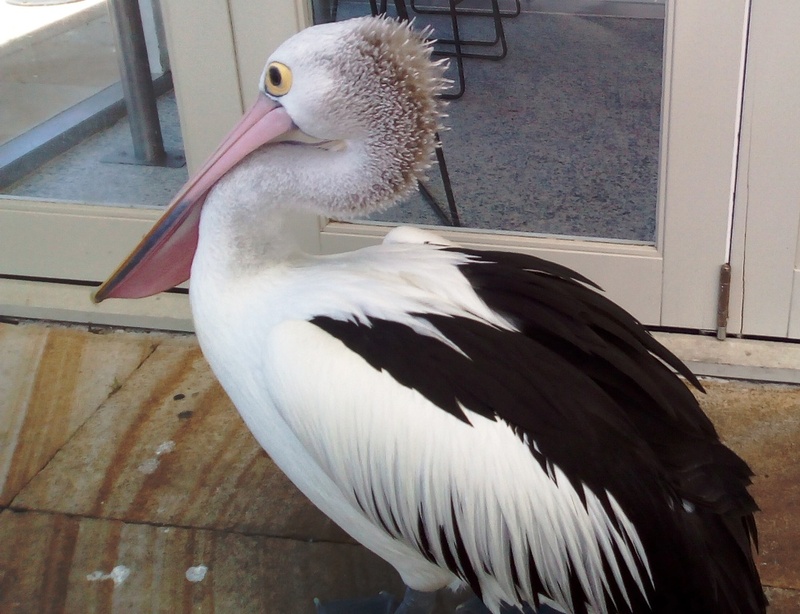 The article on this bird stated that is has a “prominent pale supercilium” – unfamiliar terminology to me. Looking it up, supercilium (good illustrations) is “also commonly referred to as “eyebrow” — is a stripe which starts above the bird’s loral area (area between beak and eyes), continuing above the eye, and finishing somewhere towards the rear of the bird’s head”. Loral area is more new terminology. The scanned photo is not as clear as the journal cover photo, but you can see that this is a strikingly attractive bird, with its sharp beak which has a lightning streak of yellow, its pale plumage neatly folded to keep out the rain, its blacksmith crafted legs and feet, and black snooker ball eye. 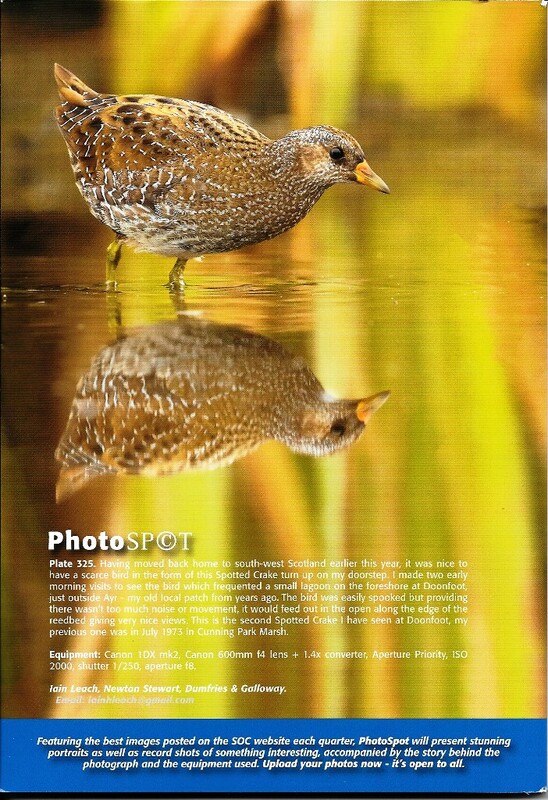 The back cover has this photo of a Spotted Crake, captured at Doonfoot, near Ayr. This bird has the wonderful scientific name of Porzana, Porzana and there is a short video of the bird at this location here. While the spotted crake does not (I think) have the elegance of the water pipit, as it has a patchwork-looking foliage, it does have a fascinating beak, with what looks like a small boat on the upper part. As with the pipit, the spotted crake’s eye is prominent and alert to food in the water. Of course, the bird’s reflection and the reflection of the reeds by the water add much to this well composed photo. This is the last post of 2017 as your blogger is taking a rest over the New Year, to return reinvigorated in early 2018. So where did 2017 go? Or 2007 or 1997 or ….? In a flash is the answer. Looking back on my extensive range of photos for 2017 and earlier blog posts, I recall the colours and reflections in a rockpool at Seacliff Beach on New year’s Day. 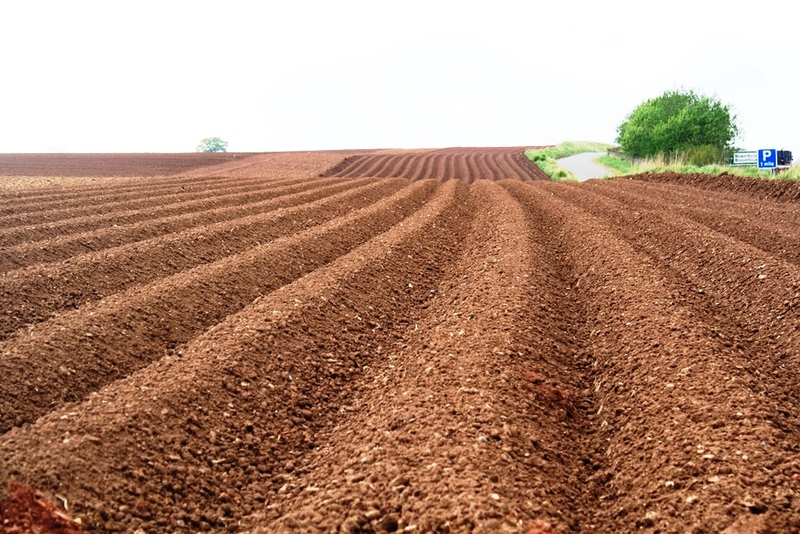 In May, it was the smooth lines of the tattie dreels that drew my attention. Soon after, the first sign of green shaws appeared and before we knew it, September was well under way and the tattie machine was lifting the crop. This field is now a vibrant green, with the spring wheat coming through. 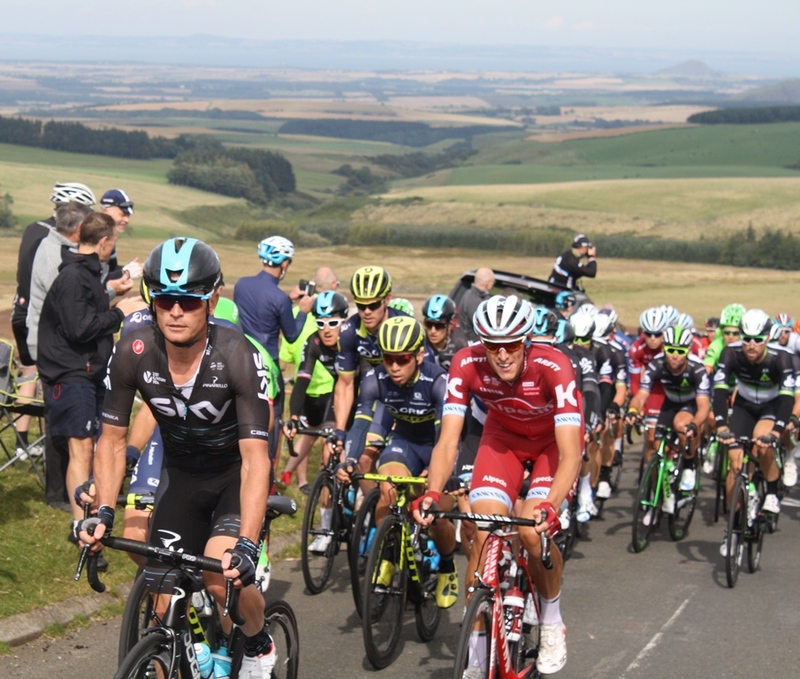 In September, the Tour of Britain came our way again and I was up Redstone Rig with my cycling pals – and many other cyclists – to see the peloton approach the big hill, with the rolling country side of East Lothian in the background. 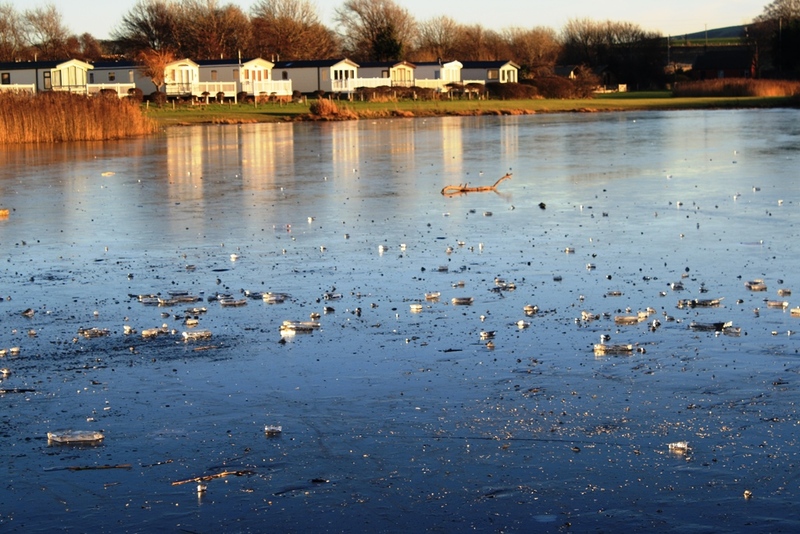 Then I blinked and it was December and Seafield Pond was frozen over on a very bright, sunny and freezing cold day. If my letter to Santa has been received and the white bearded reindeer driver is in a good mood, I may return with a brand new DLSR camera, with a video function. I’m off to leave out carrots for the reindeer and a large dram of Bunnahabhain for the man. I wish you all the very best for the festive season and a Guid New Year when it comes. Recently, I’d come to the end of the new books I’d bought and, looking along my bookshelves, I picked up a copy of Thomas Hardy short stories (cover below). I bought this book in the mid 1970s and opening the book and starting to read the first story The Three Strangers, I was immediately taken back to Hardy’s eloquent and flowing style. The story begins “Among the few features of agricultural England which retain an appearance little modified by the centuries, may be reckoned the long, grassy and furzy downs, coombes or ewe-leases, as they are called, according to their kind, that fill a large area of certain counties in the south and south west”. What struck me was the length of the sentence – typical of nineteenth century writers like Hardy – and the local words used by the writer. “Furzy downs” are stretches of rural land covered in what we might call gorse and a “coomb” is a deep valley. More explanations here. In his excellent introduction to the short stories, the novelist John Wain wrote that Hardy once said that a short story “must be unusual and the people interesting”. Wain also notes that Hardy’s short stories are unlike more modern versions, which tend have a single theme around which a tale is told. In Hardy’s stories, such as “The Withered Arm” or “The Distracted Preacher” the reader is presented with different characters, some of whom have their own intriguing tales to tell. 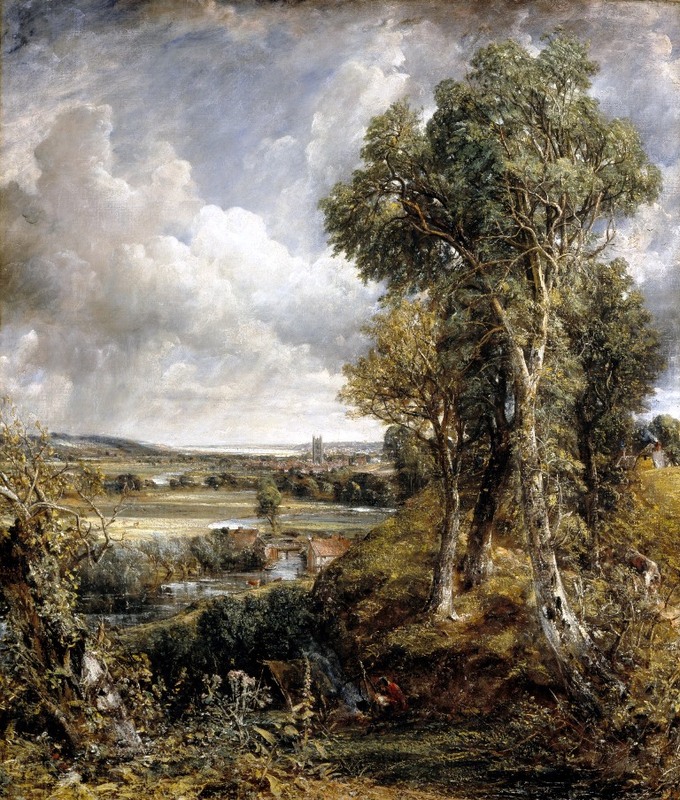 It is the context of the stories – rural Dorset in the early to mid-nineteenth century – that distinguishes them from even contemporary short fiction. The isolated cottage in “The Three Strangers” or the village in “The Grave by the Handpost” where ” a lane crosses the lone straight highway dividing this from the next parish” and where “the whispers of this spot may claim to be preserved”. 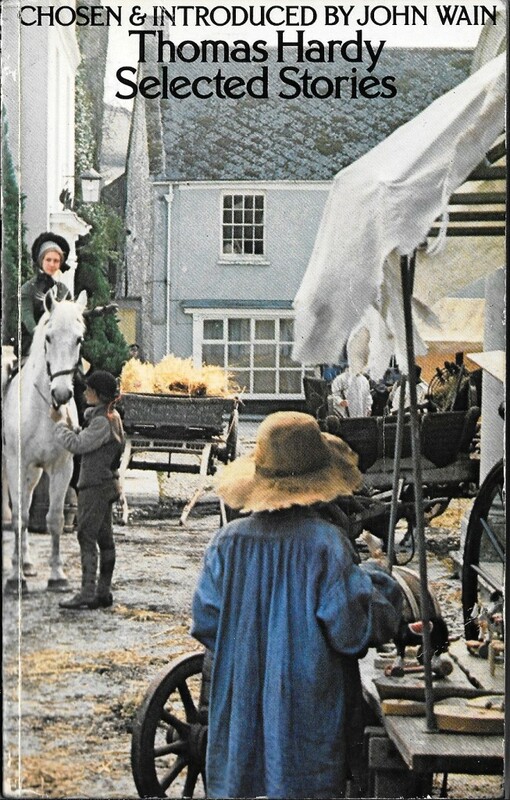 There are also echoes of Hardy’s novels in the stories such as the character William Dewy of Mellstock and the town of Casterbridge. Hardy is a superb story teller and in each story, the reader is given an early indication of what might be to follow. In “The Withered Arm”, the setting is “an eighty cow dairy” in the early evening and, with most of the cattle milked “there was opportunity for a little conversation. “He do bring home his bride tomorrow, I hear. They’ve come as far as Anglebury today”. 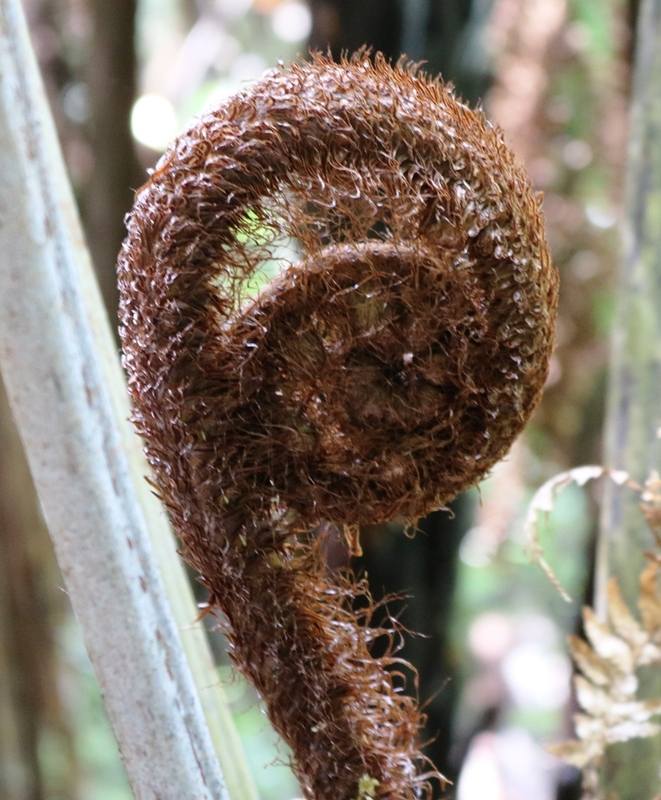 Hardy continues “The voice seemed to come from the belly of the cow called Cherry, but the speaker was a milking-woman, whose face was buried in the flank of that motionless beast”. The reader knows the setting and is intrigued by the conversation. I have enjoyed reading these stories again after many years and I encourage you to try them. 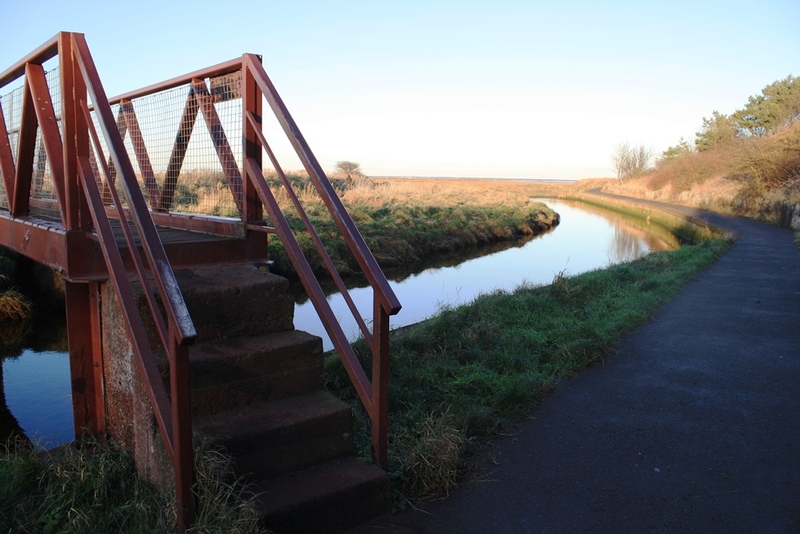 There’s a good 2 mile (3.2k) walk from our house to Seafield Pond (good photo) and West Barns bridge. 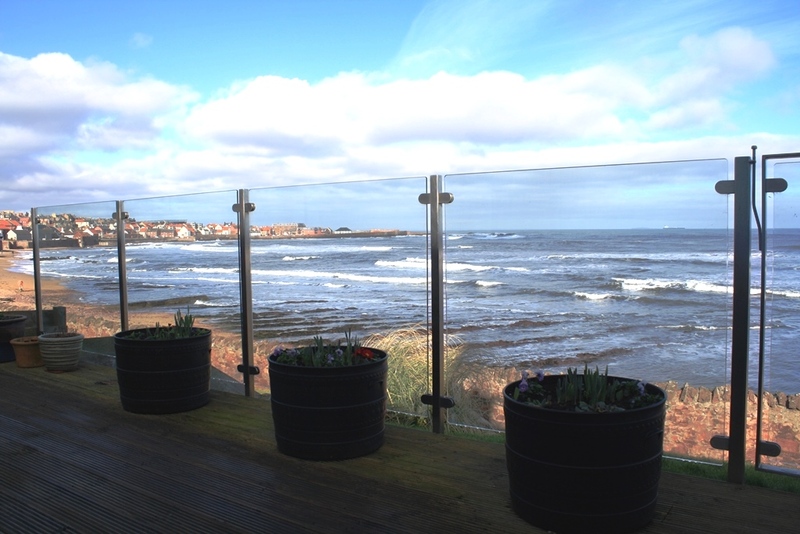 The most picturesque route is firstly to Dunbar Harbour (historical photos), then along Winterfield Promenade and on round part of the picturesque Winterfield Golf Club. I was headed for Seafield Pond first, to try to get some more photos of the pond and its birds. A previous attempt can be seen here. When I got to the pond, it was frozen over and not a bird to be seen, just some bits of wood from the nearby trees stuck to the ice. 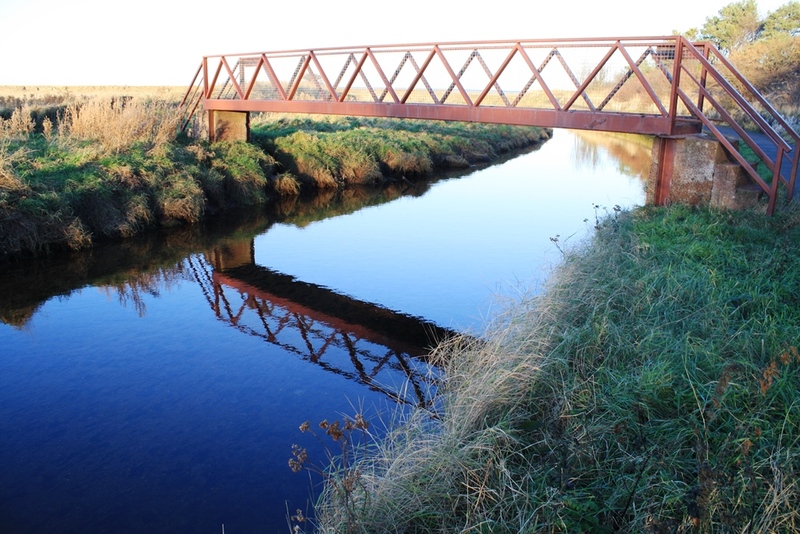 There was however, a nice reflection (see below) from the adjacent caravan/mobile home park, where you can now hire a “Deluxe running water wigwam with WC” – what next? The birds were all on the beach over the wall but firstly I walked along to West Barns bridge, which spans the Biel Burn (small river). It was a very sunny day and the previous night’s sharp frost can be seen on the entrance to the bridge here. Because of the position of the sun in the early afternoon, there was a superb reflection in the water below the bridge, with the brilliant blue water becoming paler and paler as the sun caught it fully on the bend of the river. 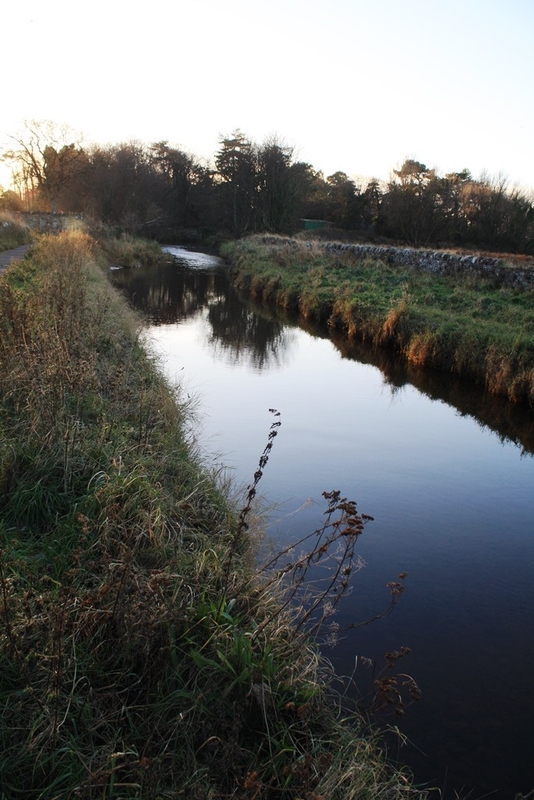 This part of the Biel Burn is where the fresh water meets the incoming tide. I know a few people – of a certain age – who spent quite a bit of their youth on the Biel Burn guddling for trout, and they each have their own secret method. This is a form of fishing in which the potential fish catcher does not use a rod or a net, but his/her fingers to catch the trout. I’m assured by two former poachers that it is an art and not a science, and that an expert guddler is born with a gift. There’s a PhD in there somewhere for a dedicated scholar e.g. “Guddling: A phenomenological analysis”. Guddling was – and probably still is – carried out in shaded areas, such as at the tree line end of this photo. It was on my way back along what is known as the Dump Road as there used to be a council tip nearby, I tried to capture some of the birds on the beach and on the water on Belhaven Bay. I was using my zoom lens and it’s difficult to get very clear photos without a camera stand. 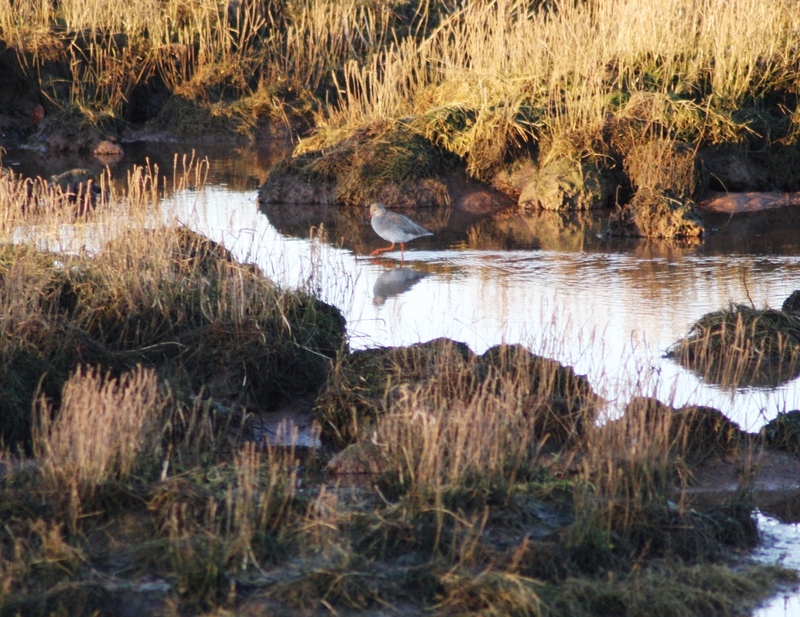 The two best were firstly, a redshank on the move, with some nice reflections of the rocks and the vegetation. 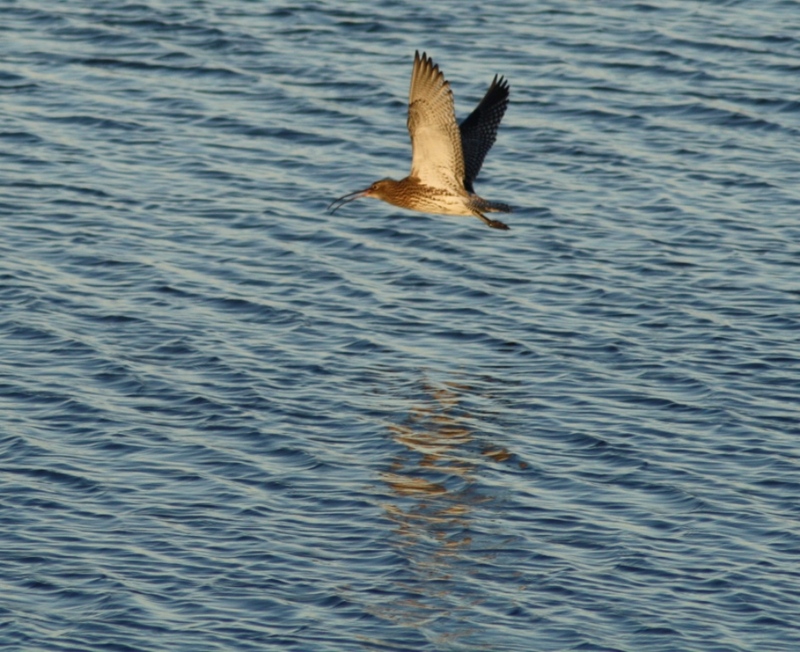 I’m more pleased with the second photo, which is of a curlew flying off across the water. While the beak is not all that clear, I do like the light on one wing and the shadow on the other, plus the reflection in the water. I used my Sports setting for this one. So a very rewarding walk on a cold but bright day and on the way back I reflected how lucky I am to live in such an entrancing environment. 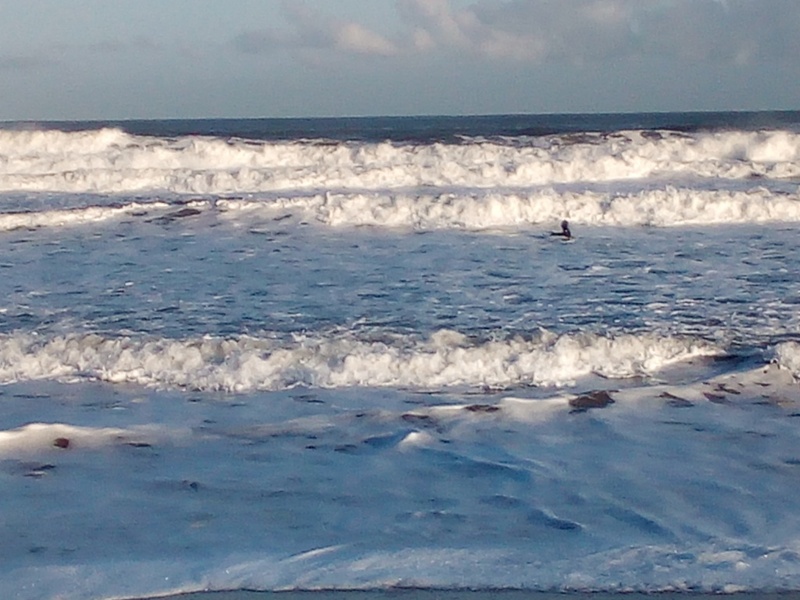 I’m very lucky not only to be living by the sea but having an uninterrupted view of the sea from my back door. Each morning when I open the blinds in our conservatory, I see something different and, of course, unique. The tide will be fully in or fully out, but more usually at some stage in between. The uniqueness of the sea – that individual wave will never been seen again, although its almost identical siblings will – and the sky – those clouds will never be seen again and if it’s a clear blue sky, that shade of blue will never be exactly reproduced. It always looks similar but it’s never the same. 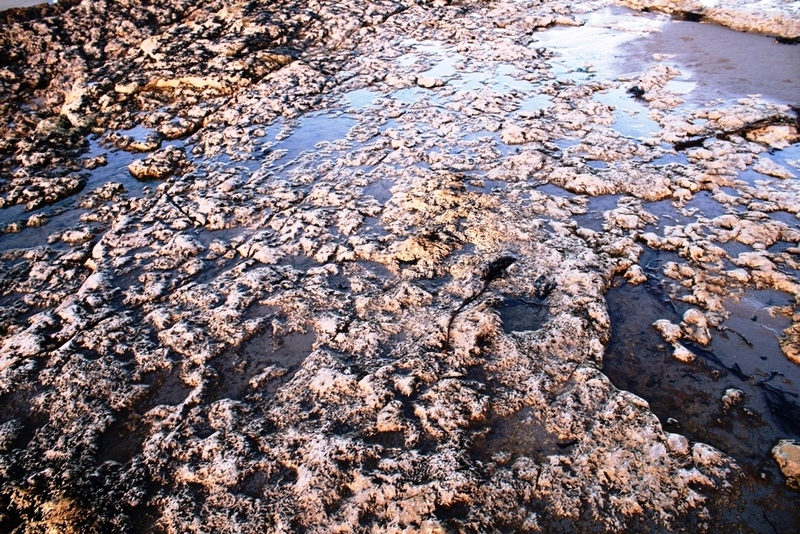 There are rocks that emerge on the outgoing tide and they attract a variety of birds, which I view through my scope. This morning, there was a small group of dunlin (includes video). 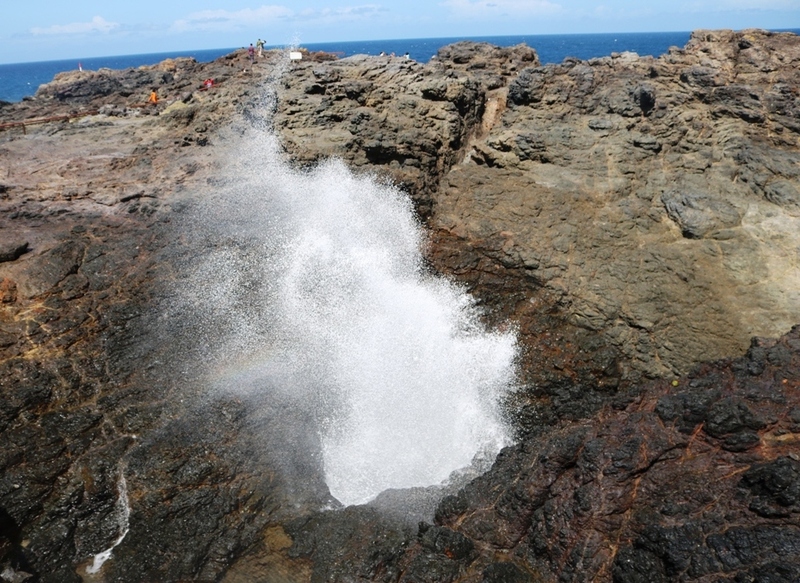 These are energetic little birds (see video) and pitter-patter amongst the rock pools, constantly feeding. I also see groups of maybe 20 dunlin take off and fly around. As you watch them they turn and flash their white bellies. It’s like a magic trick as first you see birds flying, then you see an aeronautic display of little white shapes. I hadn’t realised – until I did a search on a well known search engine – that you can see murmurations of dunlin, as in this spectacular video. What I see out of my window depends, of course on the weather and last week, on consecutive days, I had contrasting views of the sea. 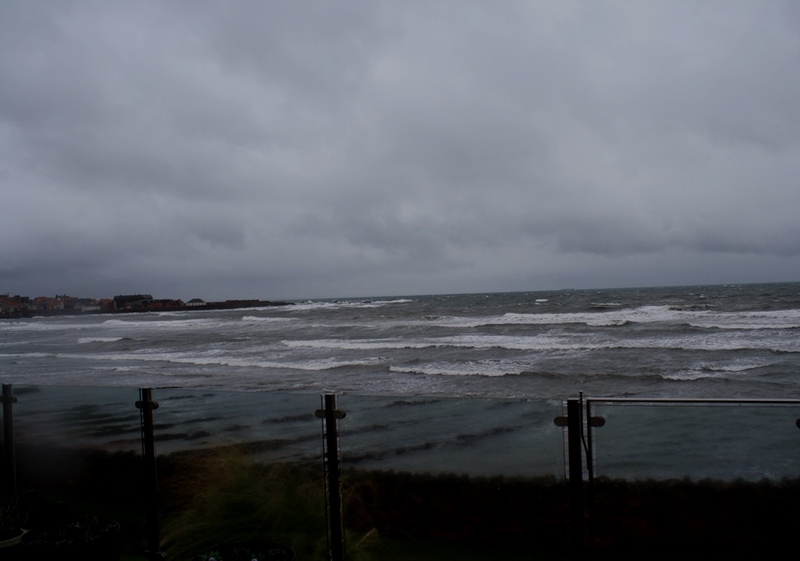 On one day, as in the photos below, the sea was universally grey, apart from the white waves, and the rain battered the balustrade. I took the photos in a slight lull, when the rain had eased off a touch. 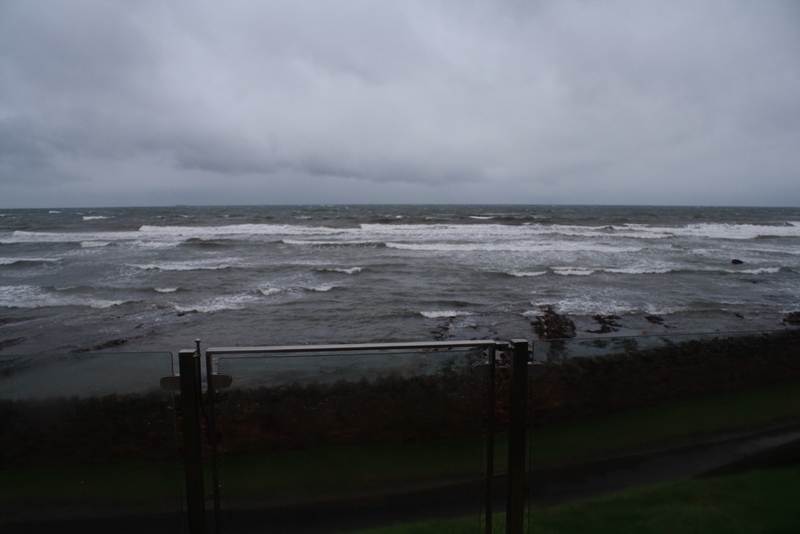 For most of the morning, the rain spat angrily at the sea, the land and our house. It was driven on by its pal the wind, which blew off the tops of the waves. So going for walk was not an option. However, there’s a certain pleasure to be had from watching the wind and rain from the calm interior of your house. I found it interesting when I lived for a while in Australia, that people there would still have corrugated roofs on very expensive houses, as they liked the sound of the rain on the roof. The next day, the outlook was completely transformed. The storm had worn itself out, the rain had gone elsewhere and the wind – an angry old man yesterday – was now a twenty-something breeze, bringing warmth and calm. In the photos below, the white waves really are white against the blue sea and there’s a lightness about the sky, so different from yesterday’s heavy and almost indistinguishable clouds. I find it interesting that we would mostly see the 2nd photos as containing more beauty than the first two. Is that because we are conditioned to see light as more beautiful than dark? Last week, we had to replace the bulb in our bathroom and my wife returned with a new bulb. We have a solatube light fitting, which brings in natural light during the day from the roof and is fitted with an electric light for night time. 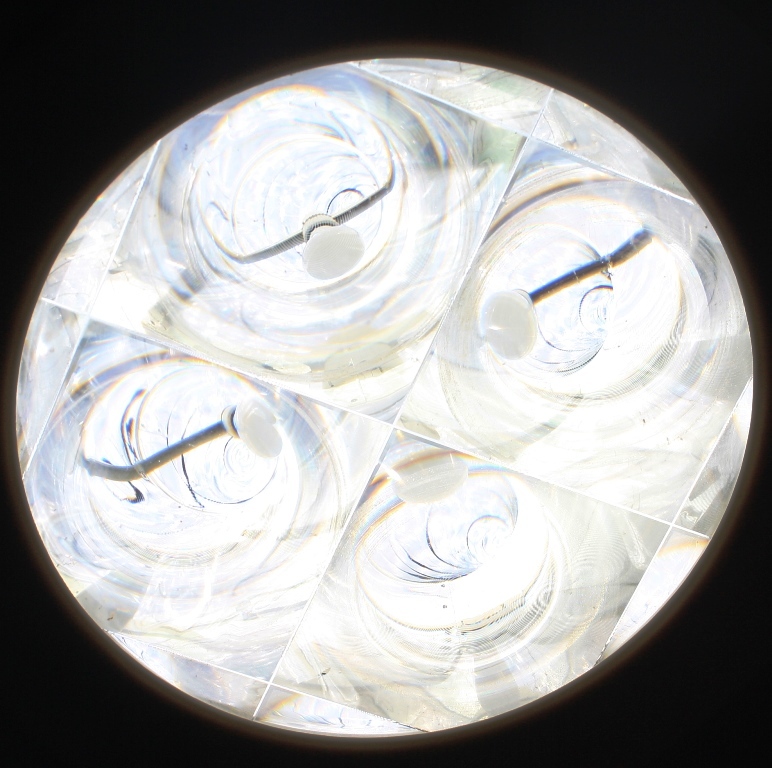 The light – photo below taken in daylight – looks as if it has 4 bulbs but it has only 1. 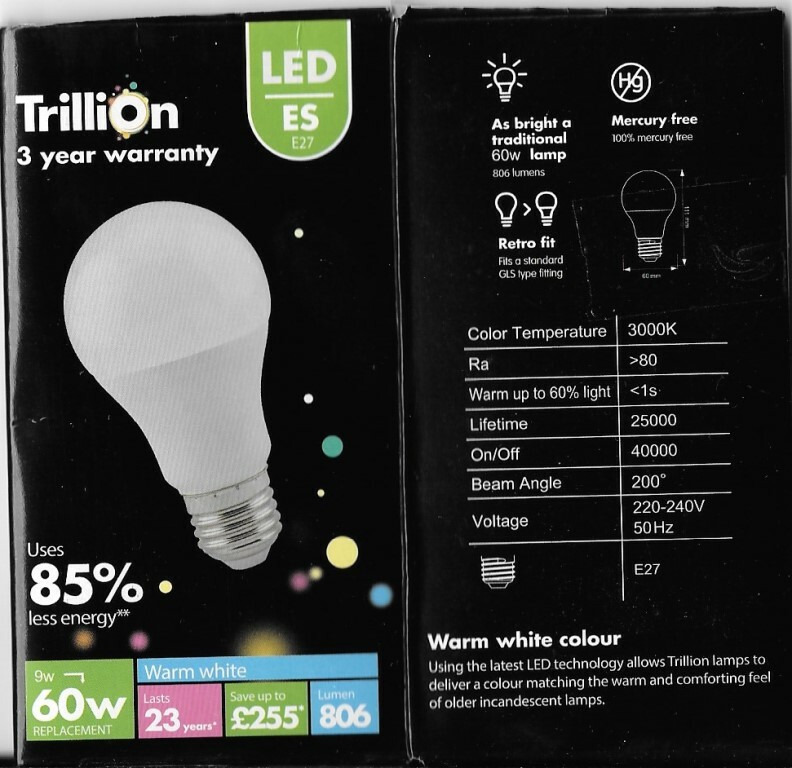 When I got the new bulb, I looked at the packaging (below) and I noticed 2 things. Firstly, not only does it use 85% less energy and you save lots of money BUT it claims that it will last 23 years! There’s a Scottish expression which people use, usually in a jocular fashion, addressed to someone of a certain age – “Aye, it’ll see ye oot” (will see you out). This means that a person who has bought e.g. new furniture may die before the furniture is replaced. Now, I’m hoping that I will still be here in 23 years time, although as a Scottish male, certain statistics may be against me i.e. it might “see me oot”. The second thing I noticed was the wording at the bottom right of the photo below i.e. that the bulb will “deliver a colour matching the warm and comforting feel of an older incandescent lamp”. It was the word incandescent that intrigued me, as I’d never heard of an “incandescent lamp”. Looking it up, I discovered the history of such lights which were a real breakthrough in their time. The original incandescent lamps were, according to this website ” Not energy efficient (90% of energy goes to heat, 10% makes visible light”. So now I know. I knew what incandescent meant, in terms of someone being, for example, in an incandescent rage, meaning that they were furious. By coincidence, reading this morning’s Guardian Sport, one article begins “Jose Mourinho was left incandescent after a UEFA official appeared to laugh off his concern…” This of course made me think about what an incandescent lamp might be like. A lamp so mistreated by its owners that it refuses to light up except when they leave the room and go to bed? A jealous lamp, following the arrival of a new lamp in the room, switching itself off and on constantly? Okay, I know that a lamp is an inanimate object but, can you prove that your lamps don’t light up when you’re not there?